This is Jenna’s first IDSH foal, who she says looks and moves very much like Belfrey. In her words, “(Belfrey) evidently is a very dominant sire.” Jenna has been so kind to keep us updated with photos and reports. 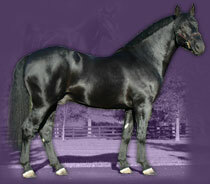 Briette will compete at the 2006 Annual Irish Draught Horse Society National Show!